BAT - BLOG : BATMAN TOYS and COLLECTIBLES: BATMAN VS SUPERMAN: DAWN OF JUSTICE + STAR WARS VII = FUN! BATMAN VS SUPERMAN: DAWN OF JUSTICE + STAR WARS VII = FUN! Well, it appears that there is a friendly "Twitter Fight" between the actual movie directors of BATMAN VS SUPERMAN: DAWN OF JUSTICE (Zack Snyder ) and STAR WARS VII (J.J. Abrams). 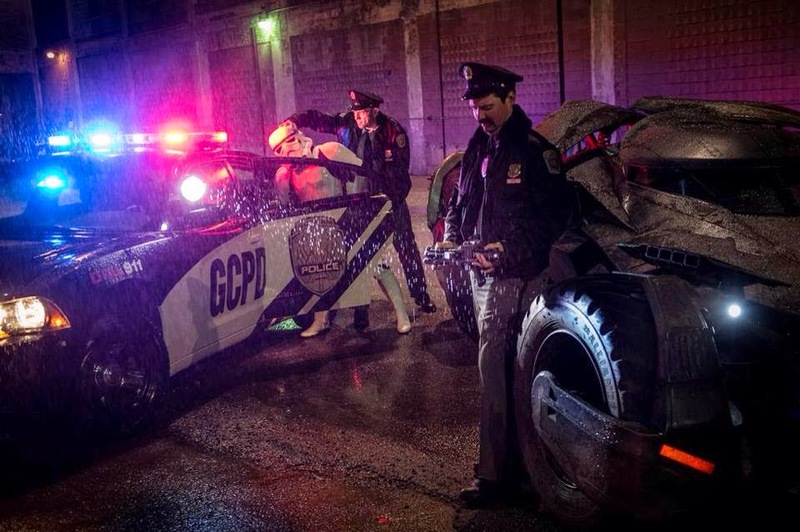 The image up above shows a digital photo uploaded by Zack Snyder that was sent to J. J. Abrams, showing a Star Wars Stormtrooper being arrested by the Gotham City Police Department (GCPD). So, in response, J.J. sent this video of the Original Millennium Falcon that will be in STAR WARS VII, and the camera zooms-in on a "Batman" item! Ha Ha Ha Ha Ha Ha! Let's hope they keep this "war" ongoing more.